...And the Devil was my first ultra. June 2007 seems so long ago. After dossing about on the Internet, I stumbled across the site for the Devil o' the Highlands. After sending Sonic the link under the title "fancy this", I proceeded with - we've run marathons, how hard can 43 miles be? How naive was I? 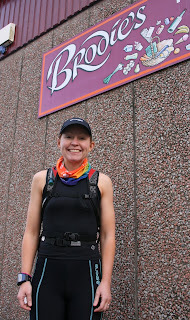 Click here for my report on last year's race. So, today was the Devil o' the Highlands - take two. After spending the night on Bridge of Orchy - caravan trip take two - we arrived in Tyndrum shortly after 6am. Sonic was supporting me again and was delighted to be up so early. Especially when we were being attack by midges. And boy do they like Sonic. The usually uneventful road to Bridge of Orchy was very dramatic. Firstly I was attacked by a sheepdog, which had me pinned against a fence. Snarling and barking with its front legs down, there was no way it was letting m past. I suppose it didn't help that I was screaming like a big girl. Thankfully the farmer appeared with his other sheepdogs and went completely mental at it. Strangely enough he didn't even acknowledge the fact that I was there. I wasn't bothered though, as I was out of there. Then I was faced with the next drama - a huge herd of highland cows directly in my path. I was absolutely terrified. I know, I'm a big kiff. I was convinced the ones with horns were bulls. Thanks Brian for telling us the charging bull story. On my approach, the wee coos were scuttling all over the place. All I needed one of those massive beasts to get all protective. They were making lots of noises, so I convinced they were devising a plan to kill me. In the end, I opted on a complete detour up and round the field. Think I need to get a bit braver for race day. The last thing I need is extra distance. Especially through marshy fields. I was relieved to get to Bridge of Orchy. I dumped my rucksack with Sonic and headed up the hills. It always feels fabulous to lose the weight off my back. I covered the section in my fastest time. Sonic even noticed and warned me to cool it. Over Rannoch Moor there was a strong head wind. The morning had the potential to be quite muggy, so the cool wind was quite refreshing. I felt really strong all the way over and didn't walk once. I would rather stay slow and steady, rather than do the whole stop/start strategy. I arrived at the ski centre in 3.15 hrs. Sonic informed me that Mags and Eric (WHW runners) were also out training. Mags had started at Bridge of Orchy and was behind me. Eric had started at Tyndrum before 6am and was in front of me. The WHW is quite lonely first thing in morning, but leaving Kingshouse just after 9.30 was like trying to get along Buchanan Street. It was after breakfast, so there were hoards of people heading over to the Devil's staircase. 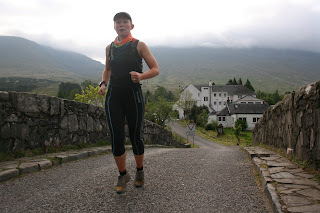 I met Sonic again at the bottom - who supplied me with energy bars and juice for the journey to Kinlochleven. The staircase was its usually stomping slog. It was really quick chilly, which was a welcomed relief. At the top I screamed out a very loud "woohoo", only to run over the brow to see a group of tourists staring at me in bemusement. I felt the road into Kinlochleven was tougher than normal. The steep descents were playing havoc with my quads. I met Sonic at the checkpoint. Thankfully he didn't tell me I was running three minutes behind my Devil's race time. Eric had arrived before me. I didn't get a chance to chat with him, as I was trying to limit my stops to two minutes max. Sonic had bought me a bottle of real coke - something I haven't drank since I was a child. Alyson Macpherson had told me that this gives her a real boost during the race. Wow was she right. It was an instant pick me up. 250ml and I was born again. I always think the Devil's route is a game of two halves. 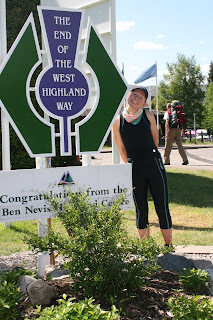 The first 30 miles and then from Lairig Mor into Fort William. 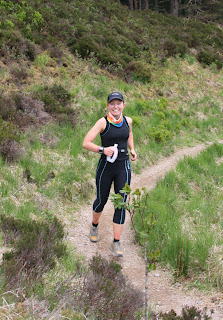 The ascent out of Kinlochleven can zap everything, but I felt great. I chatted to a few folks as I passed them on the way up. One chap even asked if I was "training for that crazy race?". The whole way over to Lundavra I mentally repeated "steady breathing. Slow jog". Sometimes I can get quite stressed and tense when I'm tired, which is a vicious circle. The calmer I feel, the better I run. I kept the pace steady and my body relaxed. The only real low point I had in the day, was a sugar-slump about half a mile from Lundarva. That was easily sorted with another dose of coke and a small bag of jelly babies. I practically flew all the way to Fort William. I was hyper and cheerily greeted everyone I passed. They must have thought I was mental - especially when the asked where I started or far I'd come. I covered the last few miles in 8m/m. I felt great and didn't have any aches and pains. Sonic was waiting for me at the Braveheart Carpark - along with Eric's support. Another swig of coke and I sprinted the way into Fort William. I finished in 8.37, which is over 12 minutes faster than my Devil's race time. I wasn't really bothered about time. OK, maybe a little. My main focus was to finish strong, which I did. I had a great run and enjoyed every minute of it. At the end of last year's race I was an emotional and physical wreck for the last ten miles, as I've never experienced so much pain. To be fair, I didn't train properly. This year, I'm much better prepared. The next time I start this route, I'll have 53 miles in my legs. 1) Injinji socks are the best. 3) Two minutes at each checkpoint is suffice. I'd much rather walk and refuel. 4) Soaking my buff in water and wearing it round my neck really kept my head cool. 5) I ate three SIS Go bars, two gels and a 100g bag of jelly babies. 6) I drank three litres of diluting juice with Nunn tablets. And 600ml of coke. 7) I had two bottles 5 hour energy. 8) I look forward to the day when I can go to the toilets at Fort William's Morrison without fearing my own reflection in the mirror. Big thanks to Sonic for being fabulous support. I couldn't have done it without him. Things you see when you don't have a camera: Two well-groomed girls walking on Lairig Mor. Both wearing skirts and knee high boots and carrying shopping bags. WTF? Great report. What a superb run. Your timings were so spot on and really consistent. Things are looking good for 21 June. Look forward to catching up on Wednesday. Debs, fantastic performance. Faster than race pace! Great report I really like that section. See you both on Wednesday! Ah the nightmare of the highland coos! I've come across them in between Tyndrum and BofO before. Never too sure whether to charge in or slip round the side. Big fearty me usually goes for the side! BTW I may have given you a fright shouting on you at the women's 10k just as you were leaving |Pollok Park. The good thing is I've got two good photo's of you taken there and at 4k. If you send me an e-mail at davidhall1956@sky.com I'll send them on to you.